On July 13, 1909, King Chulalongkorn (King Rama the Fifth) had ordered the Sanitary Department to arrange water for use in the city based on the geographical appropriateness as the following. Establish a reservoir at Chiang Rak canal in Pathum Thani province, which is an area beyond an access of saline water for all seasons. Have a canal dug up separated from the above reservoir down to the north of Sam Sen canal along the railroad. Construct a pumping station at the area near Sam Sen canal to pump up water, followed by a filtration and distribution to different places within the city, and have such an affair called “Waterworks”. when Ayutthaya became the capital of the country, the kings had ordered digging up a number of canals for circulation of water and to provide convenience to people for their consumption of water. About a hundred years later, King Narai had established Lop Buri city as the capital and given top priority to water for consumption and therefore constructed a dam for storage of water throughout the year and then installed the pipe to carry water from the dam into the city to be distributed to such important places as the royal palace, Buddhist temples, alms houses for the public, etc. According to historical evidences, it might be concluded that the evolution of pipe installation from water sources to the city for the general public had taken place in this era. When Rattanakosin city became the capital in 1782, initially, people still used water from rivers or canals and had rain water for consumption. Between King Rama 1 and 4, innumerable canals were dug up to connect them with the Chao Phraya river to facilitate the livelihood of the people. In the reign of King Rama 5 when Bangkok had around 333,000 population, after the first visit to Europe in 1897, the King ordered an establishment of the Sanitary Department for hygienic safety of the people who still used water from rivers or canals which were frequently the sources of epidemics at the time. The newly established department had made a survey and dug up a tributary canal of the Chao Phraya river at Sam Lae sub-district in Pathum Thani province in the North of Bangkok. The water was drawn though this canal into Bangkok for water supply production. In 1907, the King had made a second visit to Europe and found that most European countries had produced clean and adequate water for their people. When he returned to Thailand, he ordered to hire experts from France to conduct a survey and make suggestions on water procurement for the Bangkok area. In 1909, the King ordered the “Sanitary Affairs Department” to dig and construct canals and install water pumps in order to deliver water to water treatment plants located at Sam Sen sub-district. In addition, steel pipes were also installed underground to distribute water throughout the Bangkok area, which cost over Baht 4.0 million and took over 5 years to complete. The King had this affair called “Bangkok Waterworks”. The equipment used in the water treatment plan a hundred years ago consisted of a one-storey pumping station of 9.5 x 34 meters. Below the floor of this building was space for an installation of pipe, electric wire and 2 raw water pumps of 60 horse power, with the pumping capacity of 320 liters per second for each pump. There were 3 distribution pumps of 160 horse power each, with the pumping capacity of 250 liters per second. These pumps were all imported from Switzerland. The power used was initially from power generators but a year later electricity from a power house nearby was used instead. An alum feeder made in 1851 and imported from abroad was also applied. The sedimentation tank made of concrete was 22 x 25 x 6.5 meters and had a capacity of 3,000 cubic meters and could produce water supply of 28,000 cubic meters per day, which was able to distribute 50 liters of water to each of the 560,000 population in Bangkok. In 1930, there were more people in the city and so one more sedimentation tank of 22 x 29 x 6.5 meters was constructed, which could produce an additional 40,000 cubic meters per day. The production system at that time was composed of flocculation, sedimentation, slow and rapid sand filtration and chlorination. In 1932, lime was mixed to prevent an erosion within the pipe. The distribution system used gravity. From the treatment plant, water was pumped via 700-mm pipe of 4 kilometers to 2 elevated tanks, with the capacity of 1,000 cubic meters each. Both tanks were made of concrete and 24 meters high. A demand for water supply in Bangkok increased rapidly, from 10,000 to 13,000 cubic meters per day, most of which was consumed at numerous pubic stand posts. People in the suburb of Bangkok, who had no water supply, carried jars in their boats to take water from these posts, especially in the summer, while the waterworks increased its production to full capacity of 28,800 cubic meters per day, which was sufficient for the population of Bangkok at the time. For the quality of water supply, in 1920, sanitary officials had made an inspection every day and found no bacteria in the water. Though some bacteria might be detected, the amount was so little that it had no impact on people’s safety. The water supply produced was found clean and safe enough for consumption. In 1963, the largest water treatment plant was established in Bangkok by a French company since canals in the city were increasingly filled up, which forced people to turn to water supply more and more. Following the advent of water supply in Bangkok, the country had witnessed rapid progress while Bangkok became the center of development and prosperity. As a consequence, the government had a policy to improve water supply affairs in Bangkok so that they became up-to-date and had production capacity sufficient for steadily increasing needs of the population. 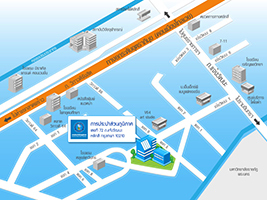 The government thus merged the affairs of Nonthaburi municipality water supply, Samut Prakan water supply and Thonburi water supply with those of Bangkok Waterworks and called them “The Metropolitan Waterworks Authority”, which had the status of a public enterprise under the supervision of the Interior Ministry, starting from August 16, 1967 onwards. It was King Chulalongkorn (Rama 5) who first introduced water for people’s consumption in Bangkok until the first water treatment plant was set up in 1914. Thirty-nine years later, in 1953, the government at that time had given an approval to the Department of Public Works to construct a waterworks at the Artillery Center at Kok Krathiem in Lop Buri called Pibulsongkram Waterworks, producing and distributing water supply to both the military and public, which was regarded as the first provincial waterworks. In 1954, the government allowed the Department of Public Works to take a loan from the Savings Bank for the establishment of 6 waterworks in Khon Kaen, Ratchaburi, Udon Thani, Chiang Mai, Phuket and Pak Panang (in Nakhon Si Thammarat), including permitting the Department to make 2 contracts of installment payment to private companies, amounting to Baht 190.27 and 80.51 million, for a construction of 70 waterworks in the provinces, through a loan from the Savings Bank.These were large amounts of money, indicating the government’s strong determination to distribute the prosperity and progress to rural areas. In 1961, when the government first introduced the national economic and social development plan, numerous artesian wells were bored in rural areas to get water for people’s consumption. In 1966, the government had arranged a project on clean water across the kingdom, with 11 government agencies implementing it. During this period, the Department of Public Works and the Department of Health were 2 main agencies providing clean water to rural people. For water supply services in the provincial areas, the government had assigned 2 government agencies to take charge of the services. In this regard, the Department of Public Works (DOPW) was in charge of the water supply services in municipal areas while the Department of Health (DOH) took care of those in rural areas. The first waterworks in the provincial region was established in 1953 at the Artillery Center of Kok Kratiem, Lop Buri and was called “Pibulsongkhram Waterworks”. When the progress had increasingly escalated to provincial regions, the water supply services provided by DOPW and DOH, which had bureaucratic limitations, became inflexible. Consequently, the government had the water supply affairs, along with the officials and employees, transferred from DOPW’s provincial waterworks division and DOH’s rural waterworks division to the Provincial Waterworks Authority (PWA), which was a new agency established on February 28, 1979, as a state enterprise under the jurisdiction of the Interior Ministry. PWA has been responsible for the production of clean water supplies that are of WHO standard in response to the consumption demand of people in 74 provinces throughout Thailand (except Bangkok, Samut Prakan and Nonthaburi). Currently, PWA has 7,730 employees, with 987 of them working at the headquarters in Bangkok, while the remaining 6,743 staff working at 10 PWA regional offices and 233 waterworks across the country (the figures as at 31, May 2014). 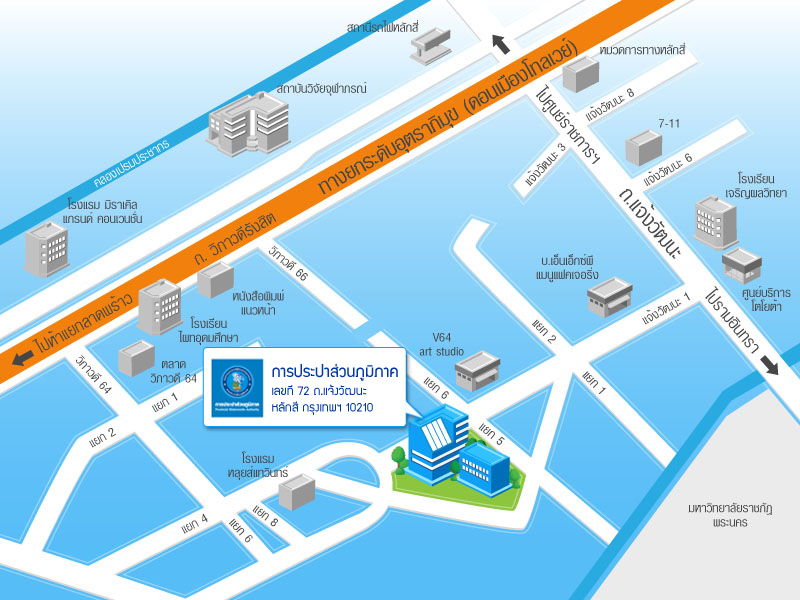 Each regional office supervises between 20 – 25 branches, each of which reports directly to the director of a regional office who, in turn, directly reports to a PWA deputy governor (operation) at the headquarters in Bangkok. At present, PWA provides water services to 3.60 million households (24.50% of the country’s total households) or 16.0 million population. Meanwhile, MWA provides water services to 2.1 million households (12.5%) or 8.4 million population in Bangkok and 2 neighboring provinces, while local governments give water services to 11.5 million households (52.48%) or 38.7 million population in regional areas. It may be concluded that 3.5 million households (12.41%) or 8.25 million population, mostly in rural and remote areas, have no access to pipe-water system. There are a total of 20.7 million households in Thailand now. PWA has a total of 233 water utilities scattering throughout the country. These utilities (waterworks) are classified into 4 groups based on the number of their customers or connections listed below. 1. 169 small-scale water utilities have fewer than 15,000 connections in their service area. 2. 41 medium-scale water utilities have between 15,001 – 40,000 connections in their service area. 3. 14 large-scale water utilities have between 40,001 – 80,000 connections in their service area. 4. 9 special water utilities have over 80,000 connections in their service area.